Psoriasis is a chronic autoimmune skin disease that causes red, raised, and scaly patches to appear on the skin. This is thought to occur because the disease speeds up the growth cycle of skin cells which causes dead skin cells to build up and form thickened scaly patches. Psoriasis usually appears on the back of the elbows, knees or scalp although it can be found on any location on the skin. 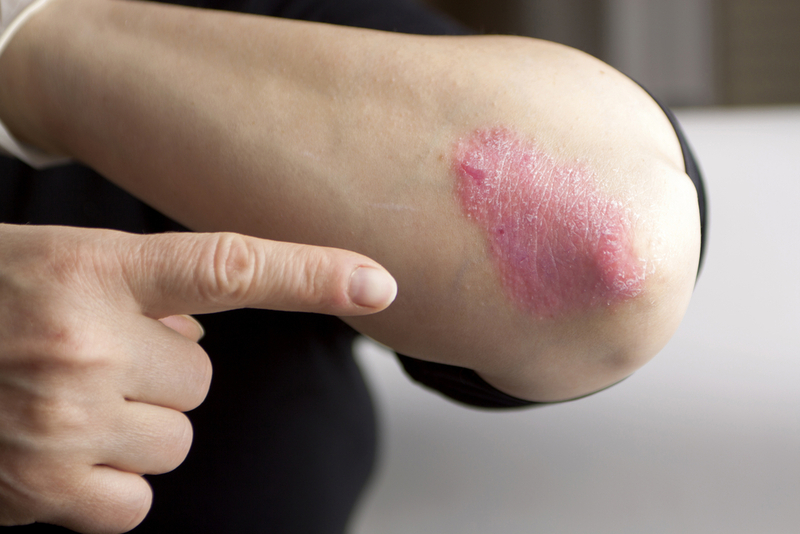 Some patients report that the raised patches itch, burn and sting. The disease can affect children but it occurs mostly in adults and there are no differences in the percentage of women versus men having the disease. Psoriasis is the most common autoimmune disease in the United States and according to the World Psoriasis Day Consortium it is reported that 2-3% of the worlds population is affected equaling 125 million people worldwide. New studies have reported that this common auto immune disease of the skin may also be an risk factor for developing cardiovascular disease. One data review study evaluated 520 patients with psoriasis and they found that the patients with psoriasis had a significantly higher risk of having a heart attack and developing heart disease. One additional study took a deeper look into whether patients with more severe psoriasis scores were associated with increased inflammation in their blood vessels through imaging techniques. The study included relatively young patients without cardiovascular risk factors and it included patients with and without psoriasis. Overall, the study concluded that psoriasis severity is associated with vascular inflammation which goes beyond more common cardiovascular risk factors. Psoriasis patients were found to have increased neutrophil activation and neutrophil markers, and other biomarkers that relate to both skin disease severity and vascular inflammation. Overall, this new evidence suggests psoriasis patients may need to be more aware of their overall cardiovascular health and be evaluated on an ongoing basis for other heart disease risk factors. Taking cardiovascular disease precautions may also be important through routine monitoring of cholesterol, high blood pressure, weight and diabetes and exercising a heart healthy lifestyle.